Today is Mina’s afternoon to spend with her grandparents and it’s always a conundrum as to eating with or without her. At 5 o’clock, Benji started foraging for food in the kitchen requesting bagels, so i alerted Papa and said we’d better get going. 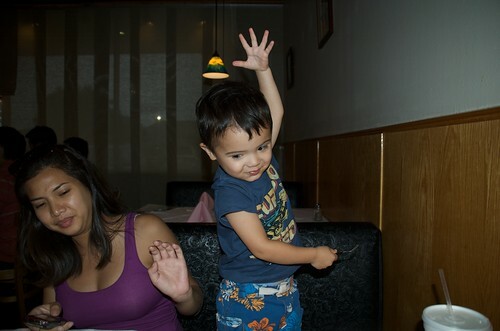 Luckily, Benji, my little food connoisseur was ready to go when he heard we were going to have sushi and immediately asked for “Chicken Ah-geh” (Chicken Kare Age). I put him in the car and as I started to get myself settled, Benji reminded me to get his sushi (his sushi toy). Ogre was just coming out of the house, so I sent him back in. We were finally ready to head to Simon’s Sushi, a restaurant recommended to us by a reader and very close to home. We walked in and Ogre immediately noted that everything was pink, “Mina would love this place,” he said. He was probably regretting not waiting on Mina because he is pretty well wrapped around that child’s finger. Oh well, Benji likes pink, too. 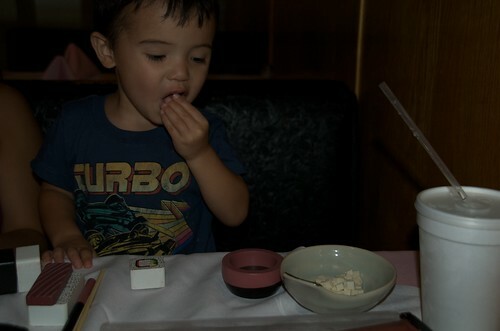 We were seated right away and busted out the toy sushi and I helped Benji figure out how to stick the sushi together and cut it much to the amusement of some of the waitresses. We ordered soup and Benji’s meal while we looked over the menu. 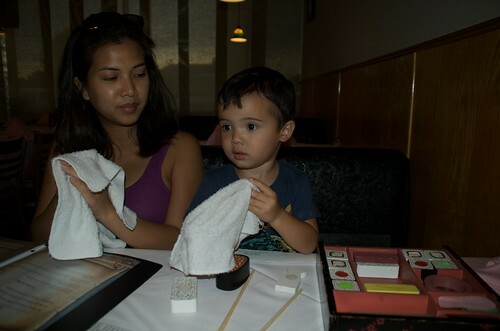 Our waitress brought the hot towels and Benji very seriously cleaned off his hands and handed it back to her. 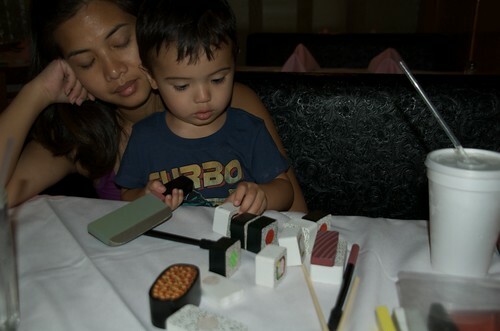 Benji played with his sushi while Ogre and I looked at the roll menu since we were new to this restaurant. I know that this picture looks like I am sleeping, but I promise that I’m not! They brought the soup and tofu for Benji that I requested. Benji was really excited about my soup and amused himself by drinking it before I said it would be okay and feeling how hot it was. 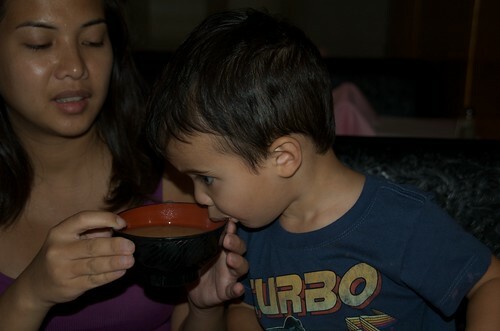 I ended up just pouring a little soup in his tofu bowl and he drank his soup just like Mommy does straight from the bowl. Benji’s Kare Age came out, so we put away his sushi and I cut up his chicken while he munched on some of the other items in his Bento Box. 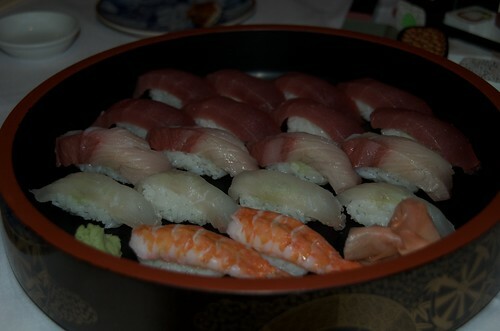 Then our sushi came out, so we were all able to eat dinner at the same time. For the most part, Benji ate well, although he did insist on having me “subu” (I don’t know if I spelled that correctly, but it’s a Filipino word that describes someone hand feeding another person) him most of his tuna and chicken. I was not planning on ordering dessert, but Ogre had other plans and order the Mochi Ice cream (mango). These were actually really good. They are small, but the mochi covering makes it so you take small delectable bites. Benji ate the ice cream out of it and then the mochi covering. 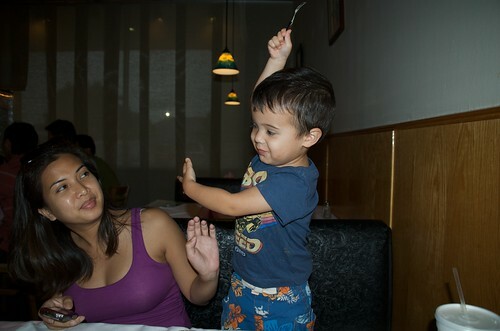 Then he did some crazy dance moves with his tiny little fork, for which I had to avoid his dangerous moves! After we finished up, we headed home to meet up with Mina. We ordered some sushi nigiri and some sushi rolls. We tried our faves: tuna, yellowtail, halibut, and shrimp. 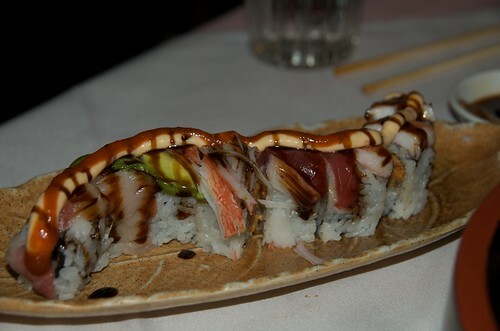 All of the sushi seemed fresh and the tuna was particularly good. A nice dark red and a buttery texture. No complaints. They do add a whopping bit of wasabi “stick” to the rice, so watch out! We tried a couple of rolls, also. I modified the Mermaid: spicy tuna with avocado, tuna, and typically salmon with spicy mayo and siracha sauce a top it. I switched out the salmon for yellowtail. It was a little too spicy for me. I liked it though, but man did my lips burn! Ogre and I ended up switching rolls! Ogre ordered the Fire Roll. His had shrimp tempura inside and was topped with spicy tuna, spicy mayo, and tempura “crunch.” I anticipated his would be spicier than mine, but it wasn’t and had all the good flavors that I like. 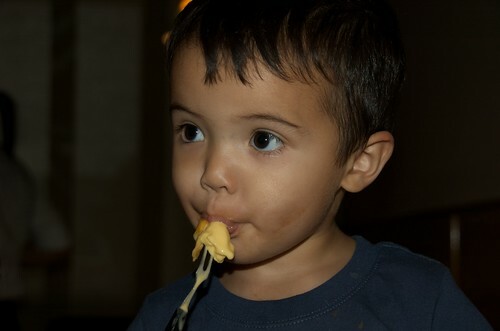 Benji had the Chicken Kare Age (kids bento), which comes with chicken, rice, some kind of styrofoam looking dehydrated something of a chip (which he loved and wanted more of), and orange wedges. Despite looking overcooked, it actually was very tender and flavorful. Ogre, Benji, and I all liked his! The Mochi Ice Cream Balls were awesome, I’d come back just for these. 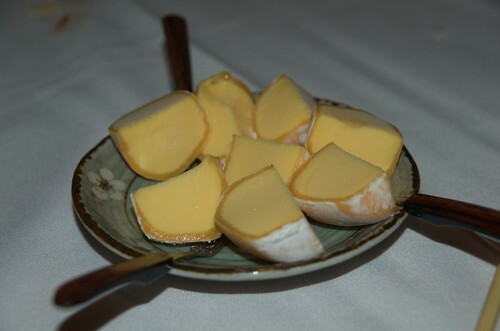 The mochi covering is nice and smooth, not too waxy and the mango ice cream was a perfect creaminess and texture. Definitely try these, they are small, so even if you don’t think you have room, you’ll have room! Great service. Our waitress was super on top of refilling drinks, checking in on us, making sure was okay, but not in an annoying way. Food comes out pretty quickly for a sushi restaurant also, which was nice. 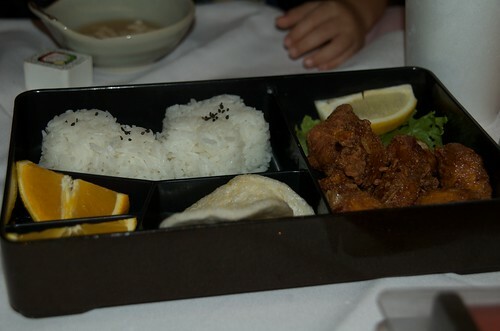 They have some kids menu items and it’s served in a cute bento for them! It’s nice and laid back, but they don’t have any kids activities (not that I’ve ever been to a sushi restaurant that had kids activities). They were very accomodating to Benji, so I’d say it’s kid friendly, particularly for a sushi joint. We liked this restaurant and it’s nice to have one that is good so close to home (we typically go to Awaji in West Plano). Super! I AM SO GLAD you guys liked it. 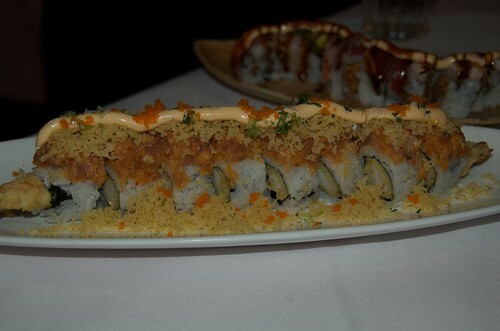 Next time, you must try the BTS roll – it is a favorite! I have not seen this roll in any other place. Keep on eating! This is another one of those places I’ve driven by a million times and never tried. Awajii is one of our absolute favorites, so I’m wondering how this place compared? Also, we have that same sushi set too now! E loves it! michelle: awaji is still our fave. sushi is just one of those things that is so pricey, that i want to know everytime it’s going to be good and it’s going to have my favorite -the mamasan roll!! haha! 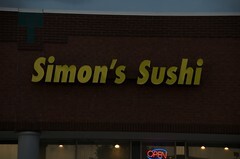 simon sushi was very good. the sushi was fresh and they have lots of interesting rolls. we would try more rolls if we go back. 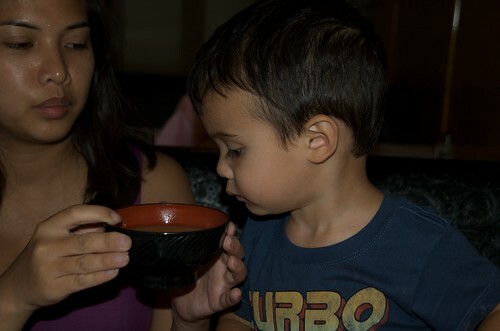 they also have kids menu choices which you don’t always see at other sushi restaurants and they were very child friendly. one downer for my husband is that they don’t have sake…but it could be BYOB also, so may not be to bad. we just usually spur of the moment go sushi, so i doubt we’d be prepared. so glad that the little one likes the sushi set. i can just imagine her chopping away!! haha! improvement. All this in 1494 and this entire still found on your modern accounting balance sheet. It can cause the pressure on the feet and all parts of body with pain when the tight shoes have. into with Awareness, is a gateway to both sexual and spiritual ecstasy. might not even know you have. any difference at all; perhaps it’s all in our minds. The most common side effects include: headache, nausea, tender-skin, and upset stomach. or blog posts in this kind of niche. Luckily I finally stumbled upon this website. many times. I found this blog on the internet. I have acquired an excellent stuff of knowledge. I have been reading out a few of your articles and i should say wonderful stuff.